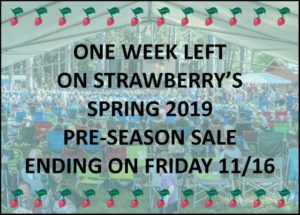 There’s just one week left of Strawberry’s Pre-Season sale, on four day camping ticket types, to next year’s Spring Festival. Discounted tickets can be purchased online 24/7, by phone M-F, 9-5 at (209) 984-8630, or by mail using our check order form, on or by Friday, November 16th. For details and pricing, visit the Ticket Information page of our website. 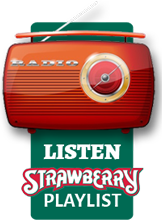 You can save big when you buy early, so make your plans now to join us for Spring Strawberry, May 23rd – 27th, at the Nevada County Fairgrounds, in Grass Valley. See you there!